Applications are invited for the post of Consultant in Psychiatry (Child and Adolescent Psychiatry, Adult Community Psychiatry). The work of the postholder will be to support the multi-disciplinary team by providing psychiatric assessments and treatments but also case consultation and supervision to other members of the team and containment of risk. This is a community-based post with a central base in Plymouth. The way the team is organised currently referrals are accepted according to specified referral criteria and after triage assessment by team members. They are then allocated for specific modality work. It is expected that there will be between two and five new assessments per week and between 10 and 20 follow up appointments per week depending on complexity. A rule of thumb for doctors in the department is five patients per day or three per half day. The follow up work may include family meetings, network meetings. The more complex cases will be jointly held with a case manager. This will normally equate to a caseload of between 50-100 patients to manage, depending on whether these are medication reviews or cases held jointly with the team. The caseload will largely comprise the more complex end of the spectrum of adolescents with mental disorders. There is a separate team for neurodevelopmental disorders and severe learning disabilities (SLD). The post holder will be encouraged to participate in research. Mental health research is within the portfolio of interests at Plymouth University. Although the employer is not an NHS organisation, an equivalent contract of conditions, benefits and regulations is provided, mirroring the national consultant contract as closely as possible. The post holder will be offered the option of a full-time or part-time contract. Candidates who are unable for personal reasons to work whole time are also eligible to be considered. Modification of the job plan would be subject to discussion on a personal basis. 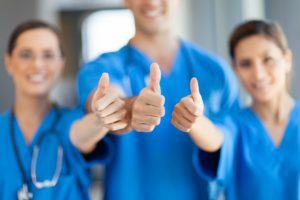 What are the best predictors of success for Medical Professionals planning to work abroad? Flexibility, professionalism, growth mindset and…the IELTS ACADEMIC. Why? This English Certificate is often decisive in joining medical councils from many English speaking countries. Listening, Reading, Writing, Speaking skills are assessed using a nine-band proficiency scale and the scores should demonstrate an advanced English (Pharmacists, Doctors, Dentists or Nurses may be required 7-7.5 for registration in the UK or in the Republic of Ireland). How are +7 scores easily achievable? Understand what examiners really evaluate: task achievement, high-level vocabulary, coherence, grammatical accuracy. Work on writing logically structured essays, about various topics such as science, employment, education. Creating two texts within 60 minutes is difficult without practice. Pay attention to the task: should you deliberate over some points of view, advantages and disadvantages or solutions to a specific issue? Grammar is 25% of your score: don’t forget about sentence variety, use of tenses and the definite article. For an academic style, write out the words instead of numbers and avoid ‘get’, ‘a lot of’, ‘loads of’, ‘kind of’ or contractions like ‘isn’t’, ‘doesn’t’, ‘you’re’ which are typically used in speech or informal texts. Structure is crucial and same are transitions, however do not use the same discourse marker repeatedly and make sure you know its meaning. While you must answer the questions always bear in mind that it is not your ideas but your language that is being tested. Are you interested in our UK roles? Let’s discuss more about this: www.ateamhr.com/contact-us/. Have you ever thought about living & working abroad? If the answer is yes, we invite you to our office in Budapest on 21st April. Meet our friendly team face-to-face and have a chat about your questions related to moving to a new country and finding a job there. Let’s discuss about Brexit, GDC, IELTS, NHS, our partner Oasis and any concerns of yours regards your professional career. We have great news for you! We are organizing an Open Day Event in Bucharest on the 28th of April. We invite you to discuss about our partnerships with hospital and clinics in Europe and about your plans. A-Team places hundreds of successful candidates across the UK and EU every year. If you would like to learn more about the recruitment process for doctors, the vacancies in the UK and France, eligibility conditions, linguistic requirements, salaries, interview preparation, or hot topics like BREXIT, then we are happy to meet you. Send us a reply stating you would like to participate and a recent CV in Romanian/English, and one of our Recruitment Consultants will reach you to offer more details about location and schedule.